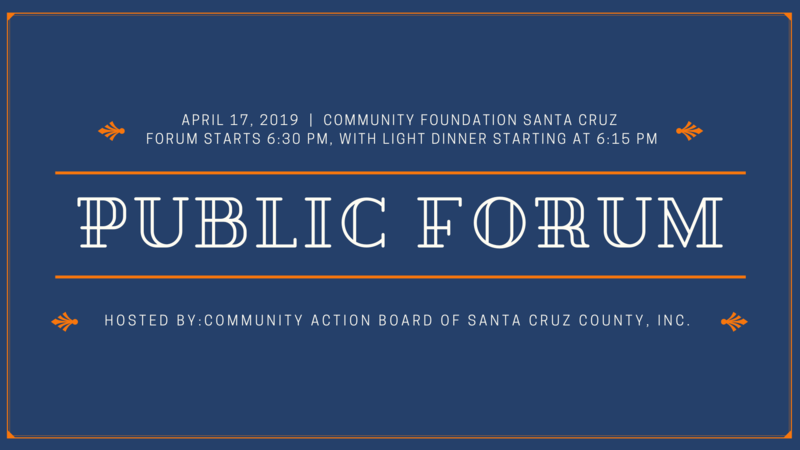 The Community Action Board of Santa Cruz County, Inc. (CAB) will hold an interactive public forum at 6:30pm, with light dinner starting at 6:15pm, on Wednesday April 17th, 2019, at the Community Foundation Santa Cruz County. We invite you to share your thoughts and experiences about needs, resources, and solutions related to poverty in the community, as well as your direct experiences with CAB programs. Your input will be combined with research on poverty in Santa Cruz County to form the basis of our 2020-2021 Community Action Plan (CAP). Spanish translation will be available at the public forum. For more information, please call or email Sergio Velazquez at: 831-708-3157 or sergiovz@cabinc.org. To find out more about CAB programs, visit: www.cabinc.org.